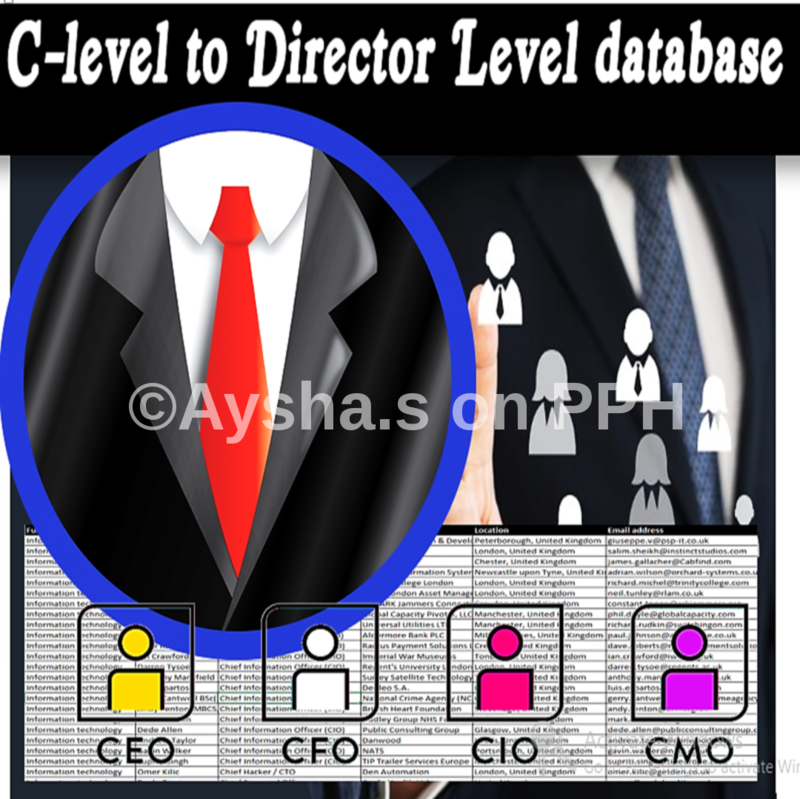 The C- Level and director level Decision Makers are considered the most important and influential group of individuals at a company. Being a member of this group comes with high-stakes decision making, a more demanding workload and high compensation. Their primary concern is to improve their business. When you need to contact key C-Level Executives and director level or VP, you don’t have the time and expense of compiling your own up to date email marketing list, here can help you! I have access to some major databases including LinkedIn premium access and familiar with some killer tools (e.g. RAPPORTIVE, CONNECT6, VIBE, VOILANORBERT, EMAIL HUNTER, PROPELIQ, GOOGLE TRICKS, EMAIL IDENTITY, FTL, SELLHACK, EMAIL TESTER, X-RAY, EMAIL GRABBER and more) to grab valid email. This hourlie cover 100 data's, ps contact before you buy. Target industry and location OR send me the excel if you already have companies list to find the person. Great work and very quick too. Always a pleasure working with Aysha. - if you're looking for marketing and business expertise & plans,research and all admin task you're in the right place. As an endorsed seller, a "PPH Super hero," I am also 'express Seller' on the PPH platform. There's a great reason why - it is vital to me to provide my clients with exceptional quality services that produce tangible results, therefore ensuring customer loyalty and referrals ... my reviews say it all. Business Development Professional with over 15 years of solid work experience across a variety of sectors in both B2B and B2C demanding environments. From my long term working experience in the service industry I learnt how to meet and go beyond every customer's expectations with service that sells. Also I have handled and helped each type of customer in each type of setting. I understand that obtaining and maintaining loyal repeat business and spreading the business through these loyal customers is very important for each company. I do keep my Clients updated on a daily basis on the progress of any project by a comprehensive SS containing detailed info on every call outcome, Decision Markers' contact details, follow up notes and any other relevant fields as well as detailed reports on progress so that approach can be tuned already in the early stages of the project guaranteeing that we can aim for the project's success from start. Leads are fully qualified to meet agreed requirements and I am always looking forward to a chance of excelling and going that extra mile. - Long track record in delivering excellent customer service and exceeding sales targets in fast paced customer focused environments with high volume of call handling in both B2C and B2B. - Flexible and easily adaptable to new situations. Quick learner with a positive can-do attitude. - Ability to multitask and to remain calm under pressure. Problem solver with analytical skills. - Career minded individual looking to put skills and expertise to the best use taking professional and personal growth to the next level. I am reliable, flexible and have good attention to detail plus very computer literate and willing to work hard to work with businesses to help them achieve their goals. I have worked with PPH for the last 5 years, done numerous jobs and always received excellent feedback.